South London singer, composer and songwriter Sampha has recently released his debut LP “Process” on Feb. 2nd. 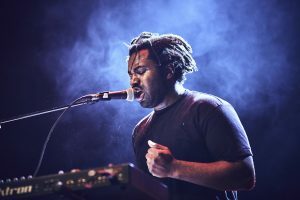 Chances are that you may not have seen Sampha before, but you have definitely heard his voice on some of your favorite songs from Solange, Beyonce, Drake, Frank Ocean and more in the last few years. The highly anticipated debut album comes off of Sampha’s EP “Dual,” which was released back in 2010 and is mix of electronic soul and future sounds. “Process” is a very honest, emotional and spiritual journey that seems to be a presenting of personal burdens that have been weighing on the singer for quite some time. On the chord driven “(No One Knows Me) Like The Piano”, Sampha tells that he ended up gravitating toward the piano when he moved back home to take care of his mother when she was dying of cancer. The first single from the album, “Timmy’s Prayer” does an amazing job at paralleling the similarities of being in the graces of someone special that makes you feel like you’re a prisoner in heaven. The album is incredibly whimsical at times, playing around with what sounds like various forms of Indian and African musical influences through the entire project. “Kora Sings” is a song that does just that, sounding like you’re dancing in a circle in the middle of a Renaissance fair, which is also a dedication to his late mother. Sampha sings “You’ve been with me since the cradle/ You’ve been with me, you’re my angel/ Please don’t you disappear,” as the track ends with angelic harmonizing until it fades. Those that are familiar of the London native might also be fans of his work with the UK indie pop electronic group SBTRKT, whom he honed his singing, songwriting and production abilities with. Listeners will notice that this album is a complete 180 degrees from what they have seen previously in his work with other artists. The short but sweet interlude “Take Me Inside” plays its way into the second part of the album that holds some of the albums most standout records. One of those records is “Reverse Faults,” a somber introspective look into how Sampha ended up blaming his partner for his own wrong doings. “Took the brake pads out the car, and I flew/Smashed this window in my heart, and I blamed you,” croons Sampha on the chorus. There’s a whole lot of pain within this album, but it is not a somber album, more of a look back on how much Sampha has been through his 28 years of living. The album closer, “What Shouldn’t I Be?” is a reminder that no matter who or what we are, we should always keep family close and that we can always come home at the end of the day. The album does really well at exposing and sharing personal experiences that resonate with listeners and ends up hitting home throughout. In all, the 10 track album sits at just over 40 minutes long, leaving you wanting more but it is actually just enough for the soul. Sampha’s debut album proves that there is a process for everything, life, death, relationships and even greatness. His expertise and influence in music might be just starting, but it’s apparent that he plans on sticking around for many many years to come.